42 Below New Zealand Plain Wheat Vodka is a popular Vodka available from Amazon.co.uk in 70cl to buy online. Visit Amazon.co.uk for the best price for 70cl of 42 Below New Zealand Plain Wheat Vodka or compare prices on our other Vodka products. Distilled near a world benchmark for air purity, 42 degrees below the equator and from GM Free wheat from the purist wheat-fields in the world. Distilled three times, then the spirit is washed in spring water, reducing the level of alcohol to 6%. This cleans any remaining impurities. It is then distilled a fourth time to create totally pure spirit. This is high saturation distilling, with New Zealand Spring water, which is unique to 42 Below. 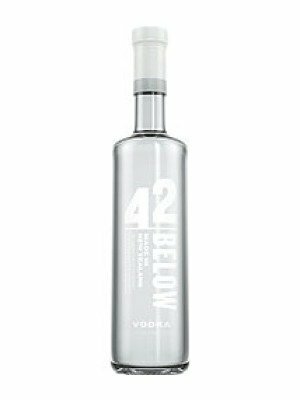 42 Below is a smooth, full, grain-based vodka similar in style to vodkas produced in Scandinavian countries, which differ from the potato and rye-based vodkas typical of Russia and Poland. A characteristic of grain-based vodkas is that they have a smoother taste than their rye or potato-based counterparts. 42 Below is batch-distilled just out of Wellington by a distiller with more than 20 years experience in the industry, using water that has attained the highest purity rating possible. Where to buy 42 Below New Zealand Plain Wheat Vodka ? 42 Below New Zealand Plain Wheat Vodka Supermarkets & Stockists. You can buy 42 Below New Zealand Plain Wheat Vodka online in most retailers and find it in the Vodka aisle in supermarkets but we found the best deals online for 42 Below New Zealand Plain Wheat Vodka in Amazon.co.uk, TheDrinkShop, and others. Compare the current price of 42 Below New Zealand Plain Wheat Vodka in 70cl size in the table of offers below. Simply click on the button to order 42 Below New Zealand Plain Wheat Vodka online now.